Check out this interview of David from 1988! #stockliveson 1 month 2 weeks ago. Join Alia Musica thisSunday for a concert including David’s “Five Four-letter Words” for flute, clarinet, violin, cello, and percussion. http://www.aliamusicapittsburgh.org/calendar/heinzchapel 3 months 2 weeks ago. Thank you Gustavo Miranda for sharing this video of your beautiful performance of David's "Two Part Invention!" https://youtu.be/_-SalcgNWaA 3 months 2 weeks ago. Stock supporters... David's baby, Pittsburgh New Music Ensemble is currently #8 in the whole city of Pittsburgh for our one-day-only fundraising campaign #GiveBigPittsburgh right behind organizations MANY times our size!! Support our campaign and help us win extra prize money to further David's mission!!! Every little bit helps! 4 months 4 weeks ago. Yesterday, on David’s third yahrtzeit (Jewish calendar anniversary of death), the Milken Archives remembered him and his beloved Pittsburgh in the best way possible — by spotlighting one of his compositions, “Yizkor” (Memorial). https://mailchi.mp/milkenarchive/yizkor-for-pittsburgh 5 months 4 weeks ago. What do you get when you get when you put four fabulous string players, one superb sound engineer, and a celebrated composer together in Mexico City in the dead of night? 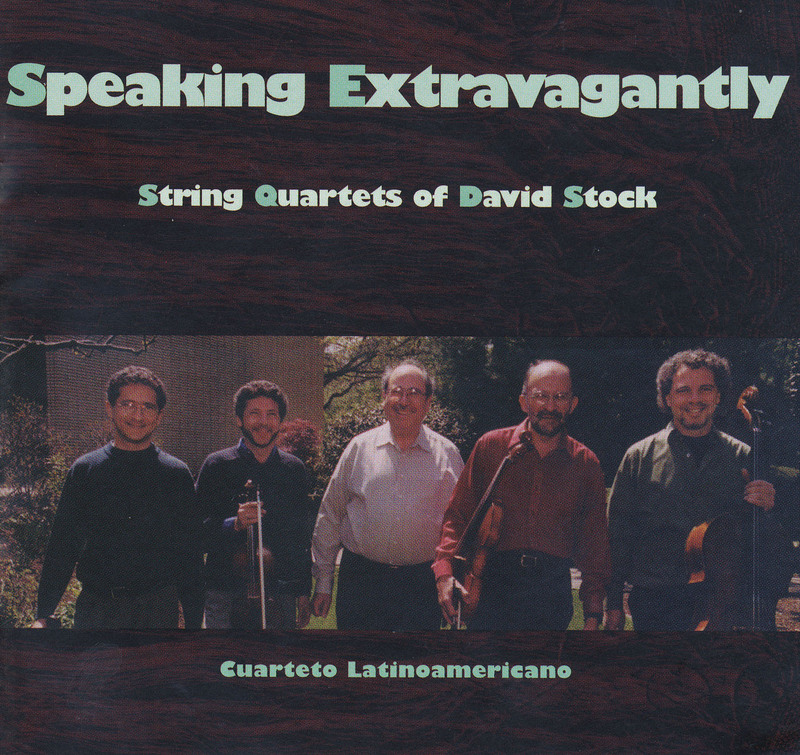 Introducing Speaking Extravagantly, a premiere recording of 3 string Quartets by David Stock, in definitive performances by Cuarteto Latinoamericano. Stock has blended influences from Ives to minimalism, from Bartok to jazz, and from synagogue music to Schoenberg into a personal style of dramatic sweep and lyrical flight. And his close collaboration with Cuarteto has produced a recording of great emotional power and driving rhythm, with blazing colors and a wide dynamic and expressive range.